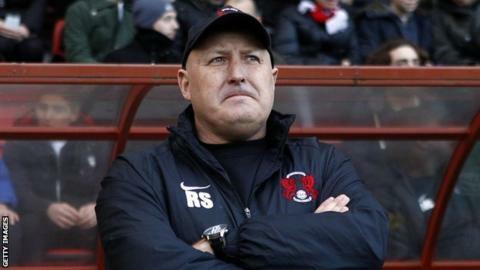 Notts County manager Shaun Derry says it is "ridiculous" that Leyton Orient boss Russell Slade could be sacked just over a month into the season. The O's reached the League One play-off final last term. But they only have one league win so far this season and Slade, whose side face Notts on Tuesday, has been told that he has one game to keep his job. "I find the whole situation ridiculous so early in the season," Derry told BBC Radio Nottingham. "We are talking about a proper good guy, a real good man." "It's baffling and bemusing when you think of about what he has done at Leyton Orient, taking them to within one kick of the Championship." Orient are one point above the relegation zone, with six points from six games. But Derry, who was coached by Slade when he was a teenager with the Magpies and at Sheffield United, was stunned that the Orient manager's future is even being discussed. "We shouldn't be talking about a person who has given his heart and soul to that football club," Derry added. "I've had a lot of dealing with Russell, not just here at Notts but at Sheffield United as well where he worked as a youth coach. "I have fond memories of him. We are talking about a proper good guy, a real good man."